The first part of this project was aimed at receiving an academic background on microfinance as an economic development instrument. The first week, the students worked with other nine Nepalese students from the Apex College in Kathmandu. This workshop included not only frontal lectures held by Professor Lanzavecchia and by professors of Apex College, Kishore Dhungana and Bharat Thapa, on the comparison of microfinance in Nepal and Europe, but also encompassed institutional meetings with experts from microfinance institutions such as the Centre for Microfinance and met one of the first mother’s group born in the rural area near Kathmandu which provide health and nutrition education. After this academic exchange, the student had the possibility to experience how microfinance works on the field. Indeed, they visited farms and other business developed thanks to micro loans. Moreover, they were in a guest house run by one of the borrowers. These visits were guided by operators of a microfinance development Bank, Muktinath Bikas Bank Ltd., which is committed for good corporate governance practices and banking activities with prudent banking culture. The Muktinath Bikas Bank Ltd. is an active social actor in the region near Pokhara. Thank to its commitment, the students joined an environmental cleaning campaign aimed at mobilizing the civil society and rising awareness about this sensitive issue. In Nepal, beside economic development, gender equality is one of the major human rights concerns. Thanks to the several meetings with women’s groups and cooperatives, the students had the possibility to experience how microfinance can be a fundamental tool to enhance women’s empowerment. The second part of the Winter School was devoted to discovering other realities in the Nepalese context, this time more focused on human rights, gender inequalities, social discrimination and right to education. The group travelled to Butwal in the Terai region, in order to meet Aman Pariyar. Aman is a human rights defender and, with his association Farm House Nepal, has developed a comprehensive approach in eradicating poverty among marginalized people. Their activities range from training in farming techniques and supporting education to raising women’s rights consciousness, in cooperation with international experts. Thanks to Farm House Nepal who created the link, and with a part of the funds collected with the campaign “United for Nepal 2017”, the students bought and delivered fans for all the classroom of a local school in west Nepal, improving the environment where more than 300 student study with very high temperature under the metal Roof. 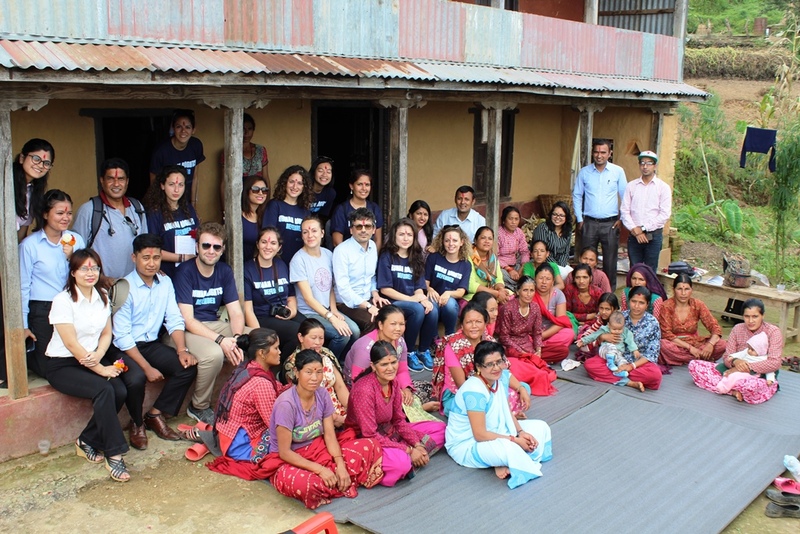 The last days of the project were spent in Sindhupalchowk district, the region of Nepal most affected by the 2015 earthquake. In Meshipa, the students visited Shree Koldaung Devi Secondary School, damaged by the earthquake, in order to deliver the other part of the funds collected with the campaign “United for Nepal 2017” and 20 computers donated by the Cedacri group. With these donations, a computer room was inaugurated with the 20 computers, one projector, webcams and an internet connection in honor of Professor Antonio Papisca. United for Nepal was organised in Padova by the MA Human Rights and Multi-level Governance students with the aim to support the work of Sagarmatha International Foundation in this area. The group had the possibility to see the progress made in the reconstruction and also to talk with the teachers about further needs for this rural school’s development. They renewed their commitment and will to further help them in the coming years. The students who participated in the Winter School “Microfinance in Action 2017” are: Alina Cebotari, Camila Casal, Daniele Marino, Giorgia Scuderi, Giulia De Paoli, Giulia Nason, Livia Bresciani, Maria Alejandra Mora Bernard, and Quynh Nguyen.